The Reformation in Britain was largely created by the ordinary people of Britain, those who had developed a strong dislike for the Church's pomp, ceremony, fasting and holy days, its cults of saints and veneration of images and relics, and its beliefs in ghosts, angels and demons. Having less emotional and financial investment in the old order than did the clergy and the landed class, they saw through the mysteries, signs and wonders of the Church, and its obsessions with Dooms and Last Days. They opposed shrines and pilgrimages, indulgences (remissions of punishment for sins), pardons, the Latin Mass and the cult of intercession on behalf of the dead in Purgatory. They rejected the monastic ideal, which neglected the service of widows, children and the poor in the selfish quest of personal salvation. They opposed the hierarchical, compulsorily celibate, mediating priesthood, and a church hierarchy that claimed proprietorial rights over what people should think and believe. They opposed church decrees (canon law) and the power of the Pope. They forbade appeals to the Pope and payments such as annates and Peter's pence. They opposed the claims of revealed religion and the all-embracing medieval Western church, which sought to override the sovereignty and independence of Britain. They moved against the religious corporations, the Pope's fortresses, which ran vast estates and made huge profits. In 1535 the monasteries' total net income was £140,000, when the Crown's was £100,000. 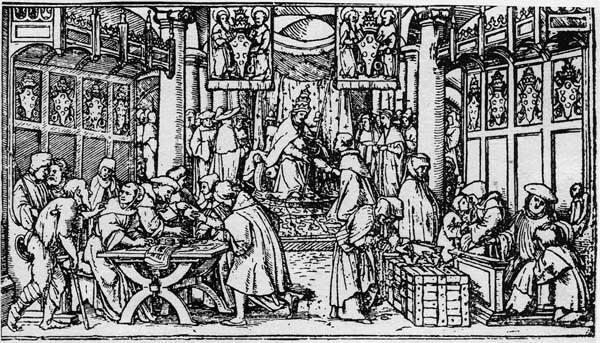 The sale of indulgences, from a print by Holbein. The monasteries were rentiers for two-thirds of their income, from whole estates put out to farm, from rents taken from smallholders, from tenements and from woods. Even their historian, Dom David Knowles, admitted, "monks and canons of England had been living on a scale of personal comfort and corporate magnificence which were neither necessary for, nor consistent with, the fashion of life indicated by their rule and early institutions." By the Act of Supremacy of 1534, the monarch became the head of the Church of England, able to appoint its leading officials and determine its doctrine. The Church would no longer be a part of an international organisation, but a part of the British state, tamed and subordinate. Henry VIII permanently suspended the study of canon law in the universities. A series of laws between 1532 and 1540 destroyed monastic life in England and Wales and in half of Ireland too. In 1535 Henry ordered visits to the smaller monastic houses to ensure that they shall "show no reliques, or feyned miracles, for increase of lucre". The Act of Suppression of 1536 ended 376 of the smaller houses. In 1538 Henry dissolved the friaries, which were centralised on the papacy. He dissolved the gilds, voluntary organisations where clergy prayed for the gild's membership. The Injunctions of 1538 opposed "wandering to pilgrimages, offering of money, candles or tapers to images or relics, or kissing or licking the same, saying over a number of beads, not understood or minded on". In 1539 Henry suppressed the rest of the houses. The Injunction of 1547, Edward VI's first year, was to destroy all shrines, covering of shrines, all tables, candlesticks, trindles or rolls of wax, pictures, paintings and all other monuments of feigned miracles, pilgrimages, idolatry and superstition. The state finally dissolved the chantries – chapels where priests sang masses for the founder's soul – and abolished the laws against heresy. In the parishes of England, all that sustained the old devotion was attacked. The church furniture and images came down, the Mass was abolished, Mass-books and breviaries surrendered. The altars, veils and vestments, chalices and chests and hangings all were gone, the niches were empty and the walls were whitened. Land and properties were seized and sold to landowners and capitalist farmers, making the settlement impossible to reverse. Queen Mary tried to re-establish Catholicism, but without the support of the religious orders, Mary's effort was doomed. Her failure proved that there was no going back. Monasticism, a major factor in the medieval world ever since the fall of the Roman Empire, was over. The Reformation made the Bible available in English, stimulating reading and the English language and ending the priestly monopoly of learning. It urged people to go back to the sources. It stimulated people to think for themselves, actively to compare and assess, rather than passively contemplate and acquiesce. Doubts were welded into a systematic and self-confident confrontation with all religious tradition, against all orthodoxy. The Reformation enabled the development of science and of industry, of history and archaeology, promoting the rational investigation of empirical evidence instead of relying on texts and authorities, and ignoring the pressures from church and state. Amid the complexities and divisions of the Protestant world, there was more room to manoeuvre, to question and innovate. Finally, the Reformation asserted the sovereignty and independence of Britain, a nation free from foreign ownership and control, "a noble and puissant nation rousing herself like a strong man after sleep, and shaking her invincible locks", in Milton's magnificent words.